Move over Albert Einstein, Isaac Newton and Charles Darwin, Big Brother Africa presents Oneal. This Botswana Housemate has set himself above the average by upholding intellectuality as his reason for Nominating fellow Housemates. 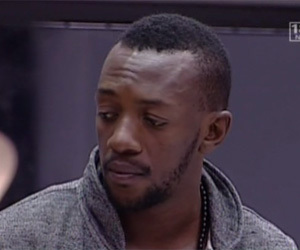 In his head he is the most intelligent Housemate and the best thing that’s ever happened to Big Brother Africa. Since the beginning of The Chase, Oneal has been making it his prerogative to put people in their place and generally lecture them about manners. It’s a wonder that the other Housemates have not picked up on his clearly superior demeanor. Especially after last night’s appearance in ‘court’, it’s clear that not only is intelligence important to Oneal, but he himself is well spoken, even in a drunken state. That is why we’ve decided to write him this letter, to try and reason with him. On Saturday after the chaos at the Party, disgust was written all over your face. You fired from all cylinders, charging at Housemates’ drinking habits, the way they acted at the Party and even lectured them about how important you are in your country. Okay Oneal, we understand that you’re a club DJ in Botswana and always make the VIP list but could you please chill for a while and enjoy your stay in the Big Brother Africa House. “Me this, me that!” Of course you’re hot, but there’s no need to flaunt it for your Housemates…or for all Africa, in fact. You’ve been Nominating your fellow Housemates just because they don’t stimulate you intellectually, oh please. Which part of ‘relax’ don’t you understand? Don’t you know that there’s a time for everything? Maybe you should take a leaf from some Housemates who have shown both their intellectual and chilled sides. Clearly, your HoH Selly sees something in you, which is probably why she saved you from possible Eviction. We like the way you’re beginning to warm up to Feza though, which is perhaps the reason Selly wants to keep you in the game – to see how far you’ll take it with the Tanzanian beauty. We can’t wait to see you melting in her presence either – so sweet! The way you were so excited when Biggie asked you about her, it was so refreshing to watch that cute side of you. We must say thanks for being the voice of reason Oneal amidst all the madness, especially on that peeing in the bucket incident. Now, that was pure barbarism, we agree, and perhaps there’s nothing wrong with seeking intellectual stimulation but it could just be a bit farfetched in this House. So, before you spend your days worrying too much about how the world will end, there’s a much bigger prize than correcting the ills of this world here, namely USD 300 000.